For a long time, bread has been the essential part of our daily diet:we love the smell and taste of fresh bread,but unfortunately it has never been easy to enjoy fresh-baked bread in your own home. This process would take too much time, and requires relevant baking experience. This marvellous household bread maker provides you with the ability to bake fresh bread in your own home. Unlike some automatic bread makers on the market, which due to low manufacturing standards will leave you dissatisfied. This bread maker is just what you are looking for. 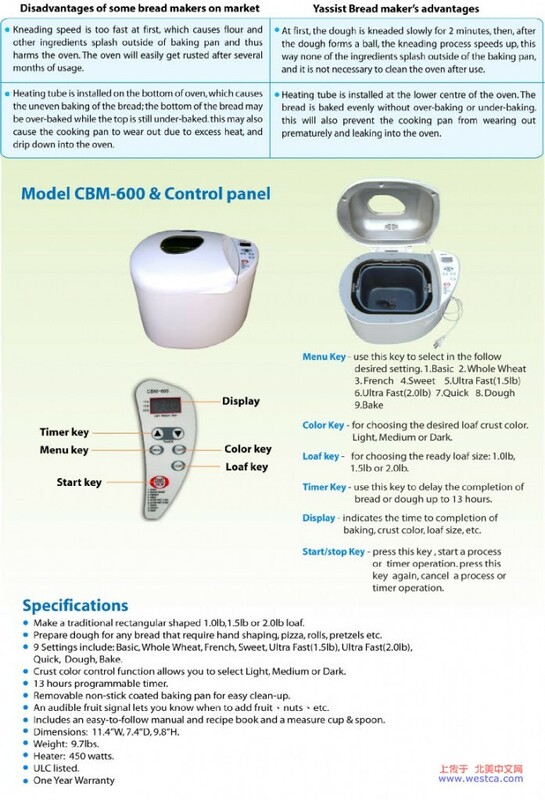 The Yasist Automatic Bread Maker is the latest model from professional and well-known bread maker manufacturer. It is a new model developed from earlier, traditional styles of bread makers with better quality and more advanced features. Whether you are an experienced baker or a complete novice, you need only to follow the recipe for fresh and delicious home-made bread. You can also use this machine to make pizza dough, rolls, breadsticks, muffins and even breads taht require hand-shaping if prepared by conventional oven baking.